Come visit iHanna’s blog and get a bit of the rainbow… Hehe. 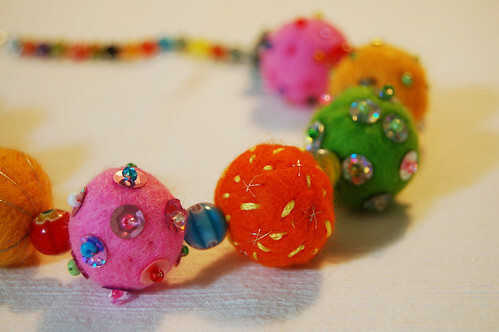 I’ve wet felted these wool balls all by myself as I’ve already mentioned – and now decorated them with sequins, beads and small embroidery stitches before stringing them together into a rainbow-necklace! I also added glass beads that I’ve bought from China (on Ebay) and love, plus two large metal beads on both sides (from Panduro). See all that? It makes me smile! 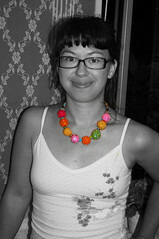 I have only wore my felted bead necklace for these photos, but as you can understand I’m very very happy about it! 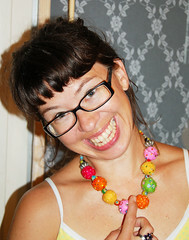 This entry was posted in A Creative Life, Crafts and tagged jewelry, self portrait. Bookmark the permalink. 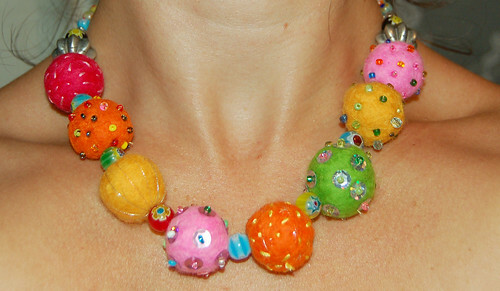 Wow, that is a fun and fab necklace! SUPER cute! Love the sparkly colors! It’s fabulous!! I love all the bright, happy colours! 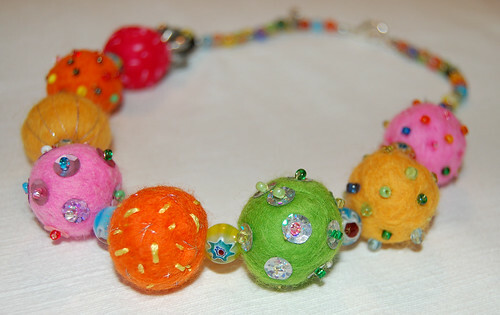 What a great folkloric necklace! I can see why you feel happy wearing it. Just the thing for a gray, rainy day! That’s the sweetest , unique necklace! It looks so great on you, Hanna! I love it. Simply love it. This necklace is so so wonderful! 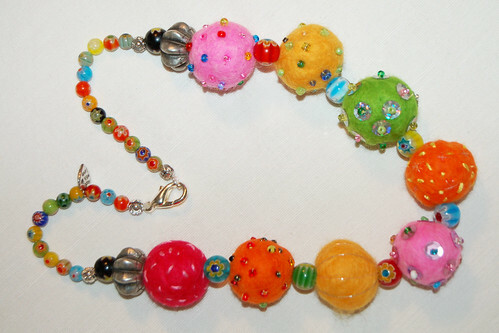 It reminds me in some ways of Andrea Scher’s superhero jewelry, because she used bright colors, too. I love how the necklace makes you smile… I think it would make me smile, too… just seeing it on someone else. Take care & have a wonderful weekend! Amazingly beautiful texture and colours. You are multi-talented Hanna and have a wonderful sense of colour. Jag ?lskar halsbandet, man blir glad bara av att se p? det! omg – these are so fab! 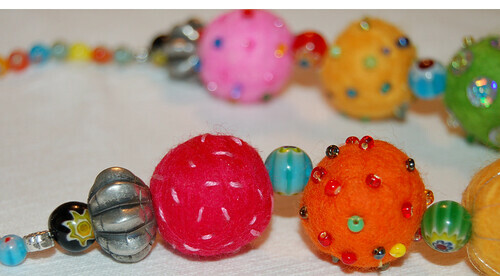 thanks for directing me to this archived post (and the others) about felting. i’m having a gas trying it…and appreciate you sharing your own adventures with me. How do you sew the sequins on without the thread showing? JoAnne, I used a small bead on top of each sequin, and that sewn on bead holds it in place so there is no need to sew the sequin down too. I hope that helps. Take care!